May 3 Day 3 That night we took a bus to Baguio at the Partas Station. 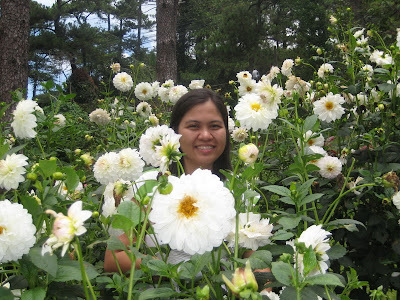 We took off at 8pm and arrived there at dawn.We stayed at Mile Hi Inn, at Camp John Hay. 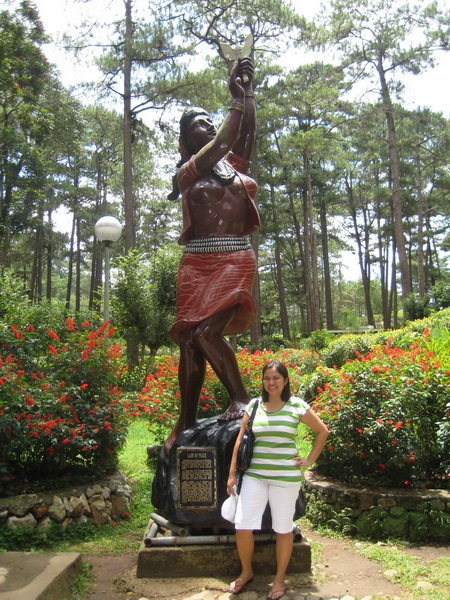 Our first day in Baguio, we went to Mines View Park. Shops are all over the place. It has a nice view of the mountains which is now being filled with houses. After that we went to Wright Park, where all the horses are. My sis even got to ride one. We chose the biggest and tallest of them all. It's a black stallion. We went up the stairs to the Mansion, the rest house of the President.Even though we weren't to able to see the Sunflower farm in Vigan, we got to take so many pics with the large sunflowers at Wright Park. We then walked to the Botanical Gardens. There are various flowers and foliage. They have giant wood sculptures. My sis ate strawberry flavored Taho.We ate our lunch at Good Taste Restaurant. Fabulous Chinese food that comes in big servings. That afternoon, we just stayed La Brea Inn, at Session Road. And it rained the whole afternoon so we extended our travel. May 4 Last Day Sunday We hiked up the stairs towards the Baguio Cathedral. It has a kind of Gothic architecture. We took a cab to Tam-awan Village. The home of artists. There are several huts from the Cordillera's for rent if anyone decided to stay there. WE also saw how they build their houses with straw. After, we went to Lourdes at Dominican, which is more than a hundred steps up a hill. There are so many shops again. Shopping is good, the products are of cheap prices. For strawberries and fresh vegetables, we went to KM16, to fields. We bought lots of fresh produce. It rained again that afternoon so we weren't able to go to the market to buy other pasalubong.